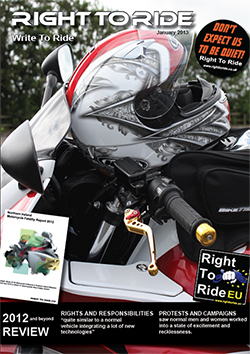 The Right To Ride – Magazine and the previous newsletters featured our website news and features in one place. Riders were able to subscribe to receive the magazine and our news articles via email to their inbox. They were sent out as a link to download the news letter as a pdf or straight to the digital version. You can still download and view the magazine and previous newsletters below. 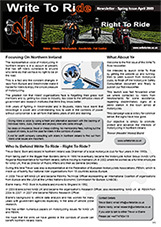 The magazine synthesizes our activities, comments and opinions and focuses in large part on legislation that has emanated from the European Union that will have a significant impact on motorcycling throughout Europe and particularly, here in Northern Ireland. As a Northern Ireland based (not for profit) company, we thought it made sense to include articles about our activities here locally. The organisation of first aid courses for riders, Crash cards for bikers are just some of the activities that we’ve promoted and set up for the benefit of the Northern Ireland motorcycling community. We also carried out an in depth study of motorcycle fatalities here in Northern Ireland in collaboration with Forensic Science NI, to understand more about why crashes happen in the first place. The study gave us the opportunity of attending International Conferences such as the ESAR Conference in Hannover and the IFZ (INTERMOT) conference in Cologne during the latter part of 2012. In our magazine, readers will find out about the generosity of bikers in this part of the world and the money that they have raised for charities. We hope in this first issue to give people a flavour of what professional motorcycle lobbying is all about and what motorcyclists do to help each other and (we hope) to explain to the uninitiated about why motorcycling is such an important part of the lives of millions of people. Finally,a big thank you to all of those who have supported us over the last year. We hope to see you on the road more often in 2013. 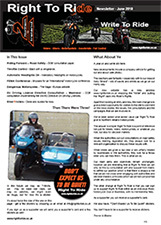 Riding Forward – Road Safety DOE consultation paper – Throttle Control Back with a vengeance – Automatic Headlights On – Mandatory headlights on motorcycles – FEMA Conference Brussels – for an “international” motorcycle conference – Dangerous Motorcycles The Saga – Europa website – EU Driving Licence Directive Consultation Madness! – DOE consultation implementing the 3rd EC Directive On Driving Licences – BikerRVoters – Done and dusted for now. Cheaper Road Tax For Motorbikes – Why Not? 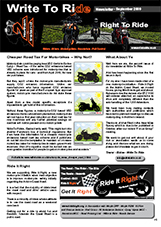 – Ride It Right – Issue – Fix A Road – Right To Ride – Helmets Off! 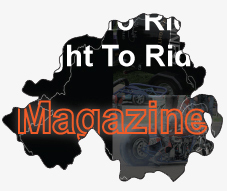 – Wired Up – Northern Ireland Gets More Wire Rope Barriers Wirerope Barriers – Support – Biker Dogs MC – Supporters – Supporters Events – Snapshot – Near Miss Accident Survey – DOE Motorcycle Roads Safety Survey. 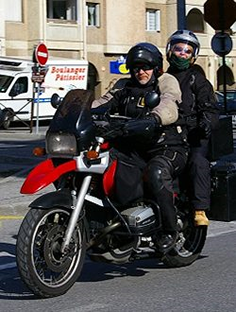 Focusing On Northern Ireland – Consultation – Motorcycle Safety In Northern Ireland – The Rider’s Perspective – Virtual Library – Campaign – Shop 4 U – Now Back 4 US – Success – Loss Of Motorcycle Licence Entitlement – Near Miss Survey – Support – Comments on the Carole Nash Theft Survey 2008.